Never let the weather get in the way of your plans. If that's how you live your life, the Mens 365 Influencer Jacket is made for you. 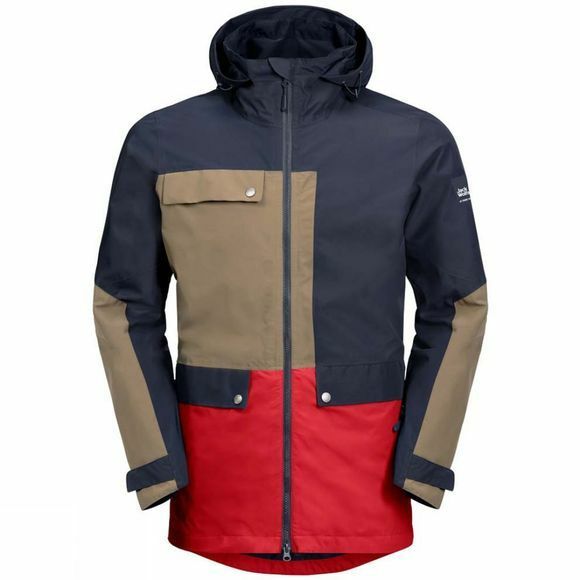 This new-concept hardshell jacket has a cool, distinctive style and is a brilliant choice for town, travel or trail. For this jacket we've used our environmentally friendly Texapore Ecosphere which consists of 100% recycled polyester. It keeps you dry, protects you from the wind and wicks perspiration quickly from the inside to the outside. You can style the hood to suit what you're doing–snug for biking, loose and comfortable if you're out for a stroll. A flick of the wrist is all it takes. The chunky button-down pocket flaps are not just practical, they're eye-catching too. The jacket has a slightly longer cut so it gives you a little more protection from the rain and wind. The Mens 365 Influencer Jacket is part of our JW365 collection, a signature range of products created for an active lifestyle between the office and the outdoors. If you're looking for a youthful, confident style, a stand-out design, full-spec Jack Wolfskin technology and a combination of outdoor functionality and everyday suitability, these products were made for you.